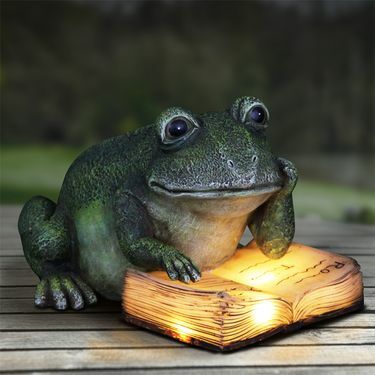 Solar garden frog takes a break from hopping to enjoy some leisurely story time. His beautifully detailed book will illuminate at dusk so he can keep on reading! Makes a great gift for the inspired reader and garden enthusiast. Solar powered LED light automatically glows at dusk. Made of durable resin, UV treated to resist fading. Size: 10.5" x 8.25" x 6.5"H., approx. 4.75 lbs.